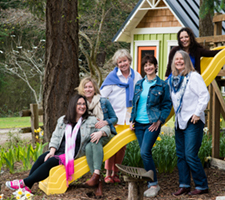 This weekend is the annual Garden Tour sponsored by the Orcas Island Garden Club. The theme is Homestead Gardens, and the focus is on “the sustainable horticulture of fruits, vegetables, herbs and livestock.” This will be interesting, and I’ll probably come home hungry with flatlander envy. My consolation prize: my flourishing native plants that have been taking care of themselves for eons. While they don’t provide a meal, I find they do provide food for the soul. 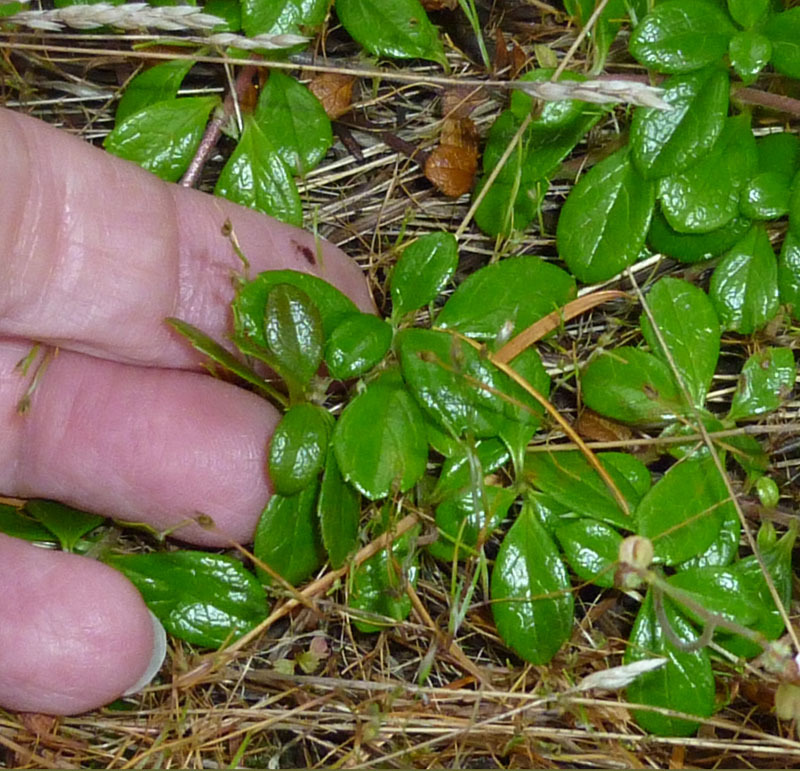 Case in point: Some years ago I discovered this cute little vine creeping alongide salal. It had been there all along, I had just failed to take notice. I thought it might be a weed, but it persisted through the winter. I took a sample to a Master Gardener, and even she couldn’t identify it. Well come the next June, this glossy evergreen creeper erupted with tiny pairs of pink and white bell flowers, dangling at the top of delicate stalks. 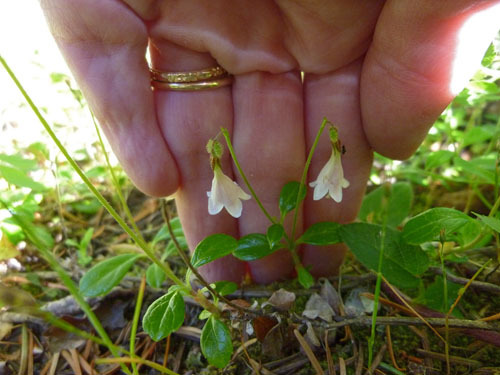 There was no mistaking it: this was Linnaea borealis, our native Twinflower. How lucky am I! I started weeding out her competition, and she immediately showed her appreciation. 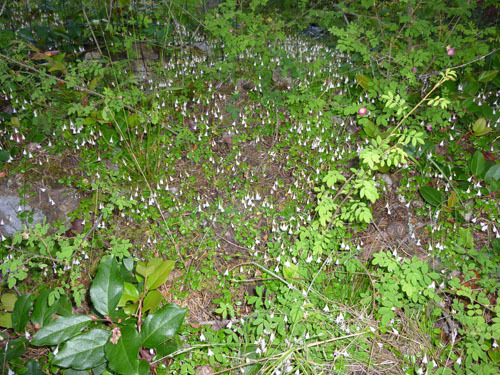 Unlike salal which is quite prolific on our property, Twinflower has selected just a few areas to thrive: a smaller patch along a sunny cliff, and a larger established mat under fir trees which receives afternoon sun. In the shady patch, the blooms last nearly all summer and keep the bees busy. Although Twinflower can be easily propagated by cuttings from runners, it’s very slow to establish and takes seedlings about thirteen years to bloom. So when taking your woodland walks this summer, be sure to look down and notice this diminutive but hardy little creeper. She’s a special one! great story Sandi; I can’t believe seedlings take 13 years to bloom! Hi, Sandi! Just a heads-up…I was a docent at Cherry Hill garden tour yesterday, and Sally Larson, our neighbor, was telling me about their upcoming trip to the Abacos..beginning at Marsh Harbour..so I told her that Bob was intimately acquainted with the Abacos..(I sailed their extensively in the 70’s)…so she and George may be calling you for info…We had an interesting chat about the book, and Sally said that “Bob rents from us”…they were tickled to find out he is the author of the BB book. Did you get to Cherry Hill on the tour? Talk about native plants and trees, Marilyn Eisner has labored for 30 years, and it is a place of exceptional beauty and serenity..